Includes one Arabian style dagger colored as pictured. The Arabian dagger is the perfect accessory to add to a period Arabian costume such as a sheik or for the city guards in the play Aladdin. 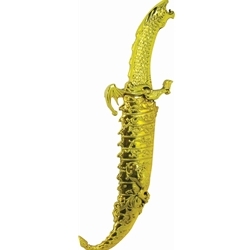 This dagger can also be used if you are looking for a unique and stylized knife to add the finishing touch to your Halloween costume.